Date: Nine thirty in the morning, Friday, April 7 30A.D. I tipped the bucket to one side to get enough swill to fill the dipper. I offered it to Jesus. He took a sip, worked the liquid around in his mouth, discerned the true nature of this bitter potion, and then spit it out. It left a dark stain on the dull gray rock near his feet. “It will dull the pain,” I said emphatically. He raised his eyes. They locked with mine. I saw in him the same look, the same determination I saw on the first day I set eyes on him, the day he rode the donkey into this city. I could still see he had a destination in mind. Some mystical purpose he somehow felt compelled to fulfill. I dropped my gaze. He must be a fool. In his condition, in this situation, he must be a fool. A fool who unnerved me, but a fool nonetheless. Once more I offered the drink. With lips pressed tight, he shook his head. He was a fool. An arrogant fool! A fool who thinks he’s tough—who can handle this—who can take it straight. We would see who’s tough. I would show him who’s tough! Let the big show begin. “Now, boys!” I called out to the crew. Still wearing the purple robe, he was snatched like a young child and slammed down onto the crossbeam. My right hand seized the hammer from Octavio. My left fumbled, then dove into, the nail pouch. I dropped my knee onto his fingers. Stabbed the sharpened point of the spike into the base of the palm. An enormous cheer went up from the crowd. Blood spurted across my thigh. The Christ was silent. Still . . .
Two in. The Christ was silent. Still . . . He was still beneath the piercing blows. I rose, panting. Heart pounding. Bloodied hand dripping. Seeing a stainfree area farther up my hairy arm, I wiped it across my sweat-drenched brow. Octavio saluted me with a smile and a thumbs-up signal. The Christ was dragged gasping—desperately gasping—to an upright position before the death mast. Now they could see him, and the crowd went wild with frenzied excitement. Cheering. Clapping. Hooting. Bloodlust took hold. The props were applied to the arms of the crossbeam. A new chant went up. Octavio signaled, and the men in back lifted the beam on which the Christ was pinned above their heads. Then we all saw it—saw the obvious. He was still clothed. The purple robe billowed out as it was caught by a sudden cold gust of wind. The sight of it brought all my frenzied demons to the fore. Then to the cheers of my men, I spit into his face. I added my spittle to all the rest that had dried and was clinging to his beard. I untied the royal robe and dropped it in a heap to my right. Finally, with a wicked smile, and to cheers all around, I snatched his breechcloth from off his loins. I tossed it to Octavio. He held it up. A trophy! We laughed. We all laughed. It was a laugh not our own. I recognized it. It was Herod’s laugh. When he had regained some composure, the head jailer started the final count. To chants of “Raise him up, raise him up,” the Christ, the Messiah, the king, was lifted up—up before the world. His head twisted from side to side in writhing agony. His whip-sliced back slammed against the upright as he was dragged higher. Then with a flesh-tearing lurch, the notch in the horizontal beam found its match in the vertical. The rope was flung around, then drawn tight, securing the two cross members as one. The silent Christ hung. He hung naked and bleeding before a jeering world. Only the last spike remained. Awkwardly, I fumbled for it. But a creeping unease overshadowed me. I glanced over my shoulder. Claudius stood alone, off to the side. Silent . . . He was ghastly pale and silent, transfixed by the sight before him. I handed the last nail and the hammer back to Octavio and said, “You do it.” He snorted his surprise, but then set quickly to his task. Date: Eight forty in the morning, Friday, April 7 30A.D. The trial of Jesus ends. The verdict is delivered. There was vehement insistence coming from the crowd. Some began to hurl dust in the air. This was verging on a riot, a point that was surely obvious to the governor, yet he played them on. “Shall I crucify your king?” Pilate called back to the throng. “We have no king but Caesar,” the Weasel spat back. The Badger’s eyebrows shot up. The governor smiled and nodded. It was a smile of triumphant satisfaction. We have no king but Caesar. The Badger mulled over these words. I knew he had waited years for these words. After all he had endured in this place, wasn’t it well worth hearing this confession from the high priest’s mouth? Ironically, the governor had Jesus to thank for the high priest’s sudden conversion and submission to imperial Rome. This declaration would never have come forth from the Weasel’s lips, except to secure the conviction of the good Galilean. Caiaphas was willing to stoop before Rome in order to spill the blood of this prophet. Here was the true measure of his hatred for the Northern Messiah. Pilate knew all this, and he drew a good measure of perverse satisfaction from it. He understood his foe. Here was the feint, the great pretend. He spoke as though he had abdicated—bore no responsibility for the blood that now trickled down Jesus’s back. He absolved himself of that and of all that would soon flow on Golgotha. This Badger could throw a bit of dirt. It was fitting for Annas the aged priest to respond. It was he who answered for the people. With his finger pointed at Jesus and his gaze fixed on him, he replied, “His blood be on us.” Then he paused as though looking down through the generations of time. “And on our children,” he added with a cold, sardonic stare. Out on the street the people answered, “Yes!” They nodded their agreement with this verdict. and so he will lift his head high (NIV). 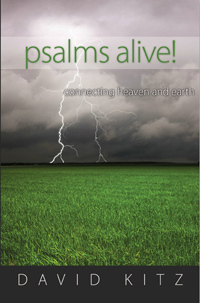 Psalm 110 is perhaps the most messianic psalm in the entire psalter. Jesus made a direct reference to the opening line of this psalm in a discussion he had with the Pharisees in the temple courts during the week of his crucifixion. See Matthew 22:41-46 and Luke 20:41-44. But Jesus refutes their answer by quoting from Psalm 110. His answer does not carry the same punch in the English language quote we see in Matthew, because we fail to see the distinction between the first ‘LORD’ and the second ‘Lord’. We see these words as synonymous, but in the original Hebrew they most certainly are not. The first LORD is Yahweh (Jehovah), but the second Lord is Adonai, the Messiah. Speaking prophetically by the Spirit, David was referring to his Adonai—his Messiah. By quoting this scripture Jesus was affirming his designation by God as the Messiah that the Jewish nation had longed to see. The long wait was over. Jesus the Messiah was standing directly in front of Pharisees who were blind to his presence and his deity. This Lord or Adonai is also the divinely designated priest who will present his own body as a sacrifice on the cross. The LORD has sworn and will not change his mind: “You are a priest forever, in the order of Melchizedek.” The writer of the Book of Hebrews has a great deal to say about the priesthood of Melchizedek. He systematically reasons that Jesus is our heaven-sent prophet, priest and king. See Hebrews chapters 6-8. Response: Father God, thank you for sending Jesus into the world to be my personal Messiah. Jesus, you suffered and died for me. Now extend your reign as conquering king over me and through me. Amen. Your Turn: Have you bowed your knee before the Messiah King? I rose, panting. Heart pounding. Bloodied hand dripping. Seeing a stainfree area farther up my hairy arm, I wiped it across my sweat- drenched brow. t was a laugh not our own.